1.) Pick one quality that you think a secret agent should have. 2.) Pick the correct reason to report a penguin to a moderator. 3.) What would you do if you a saw a penguin breaking the rules? 4.) Which type of personal information should be reported? 5.) Pick one reason why you want to be a Secret Agent. 6.) Pick another reason why you want to be a Secret Agent. Congratulations! 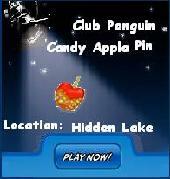 You now get to have the secret agent spy phone, go to the HQ and take on a few missions! 9. Their is 7 penguins stuck on the ice burg use the life preserver shooter to get them make sure to watch the wind! 18. Now you will go to sleep and when you wake up a penguin with a jet pack will go rescue you. 2. Go to the office and look under the couch and get the floppy disk and the paper clip. 3. Go to the computer and turn it on and put the floppy disk in. 17. He’s going to show you a picture. Then talk to him again. 23. Go to the Ski lodge and get the candle and turn on your goggles. Then talk to the blue penguin hiding under the couch. While at the ski lodge get a candle from the candle holder. 4. Look way to right. Now open the invention Cabinet then type in Key in code. Now take the Electromagnet 2000 (was it 2000?) off the shelf and put it in your inventory. 5. Click on the map to go to the pizza parlor. Now put the sheet of music in your inventory. 6. Now go to the Iceberg. Put the Electromagnet 3000 on the ice cube. Put the ice cube in your inventory. 7. Go to the Beach and pick up the green bucket. 8. Now go to the Snow Forts. Get the Green Bucket and put it in the Snow anywhere. Now put the Green Bucket filled with Snow in your inventory. 9. Now go to the Town. Talk to the green penguin (Agent Rookie) and he should give you a poster put that in your inventory. 10. Now go to the Plaza then the Stage then click on the Piano. Put the sheet of music on the piano and play the color notes in order. 11. Now go left or right and you should see the yellow puffle. Now get the poster and give it to the yellow puffle. Then give the Green Bucket fill with Snow to the Yellow Puffle. Put the Green Bucket and Snow Gear in your inventory. 12. Go to the Dock. And talk to the blue penguins. 13. Play the Snowball game and try to hit 3 targets. When you do that put the target in your inventory. 14. Go to the Ski Village then the Winter Sport Shop. Look for the life preserver and then put it in your inventory. Go back to the dock then give the blue penguins the life preserver. 15. Use your spy phone to go to the H.Q then go to the gadget room. 16. Go to the Test Chamber. Put the ice cube spring under the “PLACE OBJECT HERE SIGN” then click the red lever on the Test Chamber. Now click on the button with the fire on it and click on the red lever again. Now put the spring in your inventory. 17. Now put the snow gear under the sign. Click the red lever then the snowflake button. Click the lever again. Put the Gear in your inventory. 18. Go to the Snow Forts. Click on the bottom part of the Clock. Now put the target on the target arm on the left. Then put the gear in the middle of the gear box. Put the spring on the left side of the gear. 19. Exit the Clock. Now your Spy phone will ring. 12. Now go to the town and put the brown hat to the green puffle. Then feed the cookie to the green puffle. 3. Go to the ski lodge and find all the “Find Four” pieces. There upstairs and down stairs. Downstairs they are on the window, on the stool under the telephone, and on ladder. and here is the Mission 9 video! 1. Talk to G, Jetpack Guy, and Rookie, then pick up the solar panel in the box of odds and ends from Gary’s broken gadgets. 2. Then go to the Beach and go to the lighthouse and pick up the cream soda then talk to the The Jetpack Guy. The jetpack penguin’s fuel ran out and he needs cream soda. 3. Then give him the cream soda. 4. Follow the help message and divide the units exactly how it says until you get to the end for example if the list says 8,0,0 then take the 8. 6. Go to the Dock and talk to the penguin holding the rope. Then ask for the rope now put the rope in your inventory. 7. Then go to the Gift Shop and talk to Rookie, give Rookie the solar panel which you recieved from G’s gadgets at the beginning of the mission. Then talk to the Gift Shop manager and get the table, box of stuff, and clothes. 8. Attach the solar panel to the magnets wires. Read the instructions on how to program it. 9. Then go to the Night Club. Put the rope on the pulley near the cage and hit the lever. The machine will then break down, open it using the Screwdriver on your Spy-Phone. Then align the gears so they fit well. 10. Then teleport back to the HQ, you will recieve a call saying to to the Dock. At the Dock you will see Klutzy holding up a Herbert Dummy. 11. Your spy-phone will ring again. Answer it, then go to the Night Club. 12. Capture Herbert by pulling the red lever down on him. 13. Take the jetpack from the jetpack man and put it on the red lever or shine all the lights in the dance club to the solar panel (this is what i do) to recapture him. 14. Rookie will hand Herbert the spy phone and Herbert will escape again. Then talk to G, G will give you the Medal of Excelence. Mission Complete.